The Middle East Regional branch of Bauer Spezialtiefbau GmbH, one of the world's leading specialist foundation contractors, has recently become a licensee of AnchorTest Ltd. As documented in the recent issue DFI Deep Foundations magazine, Bauer have successful implemented AnchorTest for real-time testing and data management on the Corniche Towers project in the United Arab Emirates. Following this project, Bauer have also used AnchorTest for permanent anchors on the Duba Pump Station Project in Saudi Arabia and for removable SBMAs on the Global Gateway Residential Development in Abu Dhabi. 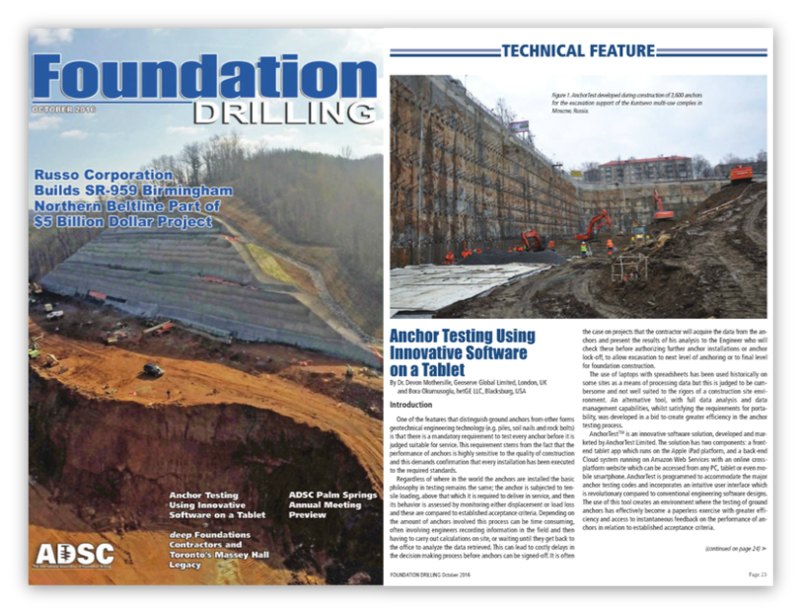 Deep Foundations magazine published by DFI (Deep Foundations Institute) enjoys an extensive worldwide readership and has recently published a five-page article featuring AnchorTest. The article includes the latest case-history updates from around the globe where AnchorTest has been used for real-time testing and data managementon challenging ground anchor projects. The September/October 2017 issue featuring AnchorTest can be viewed online here. Outstanding engineering consultant Ingerop South Africa (ISA) has purchased a licence to use the innovative software package AnchorTest. ISA has an increasing portfolio of projects within, and outside South Africa, and will use the software package to enhance their site supervision capabilities on projects that utilise ground anchor technology. AnchorTest is featured in a major article in the Foundation Drilling magazine published by ADSC (The International Association of Foundation Drilling). The article runs to seven pages and has already received great reviews. The magazine has an extensive readership that includes thousands of engineers in the US and Canada. October 2016 issue featuring AnchorTest can be viewed online here. US based foundation engineering contractor Moretrench have become the first company using AnchorTest in the American continent. Moretrench were thrilled to know that the software accommodates the US anchor code PTI DC35.1-14 and have put the tablet based tool to immediate and effective use in the field. International geotechnical contractor Kasktas AS are successfully using AnchorTest on major projects in Izmir, Turkey; slope stabilization works at the STAR Aegean Oil Refinery and excavation support works for the Petkim Container Port Backyard. Kasktas (Moscow) have also used Anchortest for deep excavation support at the US Embassy New Office annex in Moscow, Russia. These projects had highly demanding testing specifications and featured permanent ground anchors. The Izmir projects comprised with multi unit strand anchors (SBMAs) with up to 380tons of test load stressed and tested in accordance with BS8081:1989, and the US Embassy project in Moscow utilized pre-fabricated mono-bars installed and prestressed in accordance with the latest PTI DC35.1-14. Kasktas saved time and money thanks to AnchorTest's tablet and cloud-based solution, which facilitates on-site analysis and data sharing to nominated parties instantaneously thereby speeding up the approval procedures for installed anchor certification and subsequent lock-off. Geotech Civil are the first Australian company to acquire and implement the innovative AnchorTest software, specifically designed for iPads. Geotech Civil will use the cloud based system on all their current and future ground anchor projects to analyse and manage the data produced from ground anchor testing. Geotech Civil are also collaborating with AnchorTest Ltd to further enhance and develop the available applications. In July 2014, Dr Mothersille addressed a special audience comprising specialist Japanese anchor contractors to introduce AnchorTest; the paperless cloud-based tool for stressing and testing of post-tensioned ground anchors. After almost 2-years of conceptual design and development work, undertaken by the partnership of ground anchor specialist AnchorTest Ltd and the outstanding team of international geotechnical software developers hetGE LLC, AnchorTest is finally here to revolutionise the stressing and testing of ground anchors.